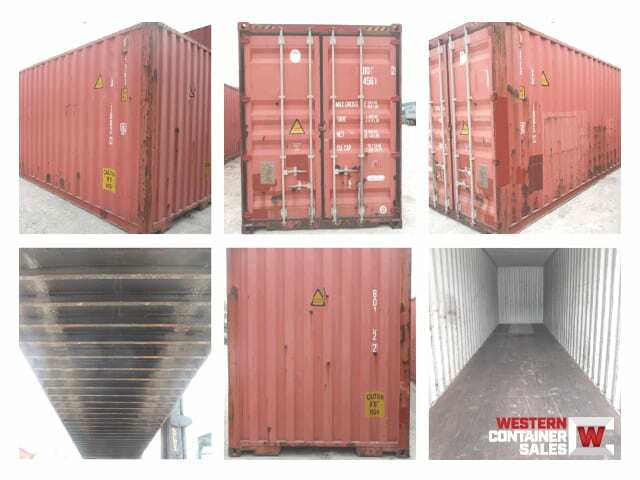 Sale units sourced from Toronto, Ontario area intermodal shipping container cargo pools. Every container we sell comes with our guarantee. Read real customer reviews and see more of the companies we've worked with here. We're in the final stages of ensuring we can provide a high level of service to customers in Toronto, ON. This page will display live pricing the moment we begin offering service in Canada. Check back in the coming weeks for updates, and please feel free to contact us with any questions. Select the size, condition, and door direction that meet your needs, then add your selections to the cart and checkout in our secure payment portal. Make sure to check out the sample photos before you buy. Your container is guaranteed not to leak, and comes with a 30-day money back guarantee (less trucking costs). Every container we sell is also backed by our one year warranty. We source your containers directly from intermodal cargo circulation, so you avoid paying unnecessary middle-men. After your order is placed, you'll receive a confirmation email. You then get the next container off the stack that meets your criteria. We guarantee the doors, floors and roof (but not the cosmetic condition). Color cannot be selected. We'll be in touch within one business day to confirm your order and coordinate the logistics. To ensure everyone's safety, only customers with the proper equipment should select intermodal depot pick-up (please allow 2-3 business days for release information). Delivery is optional and calculated at checkout by zip code. Contact us with any questions, we're always happy to help. Not Sure of the Difference Between CWO & WWT? "Very simple process & pricing. Representatives are quick and responsive, and there is immediate follow-up to ensure the purchase is correct and shipping is taken care of." "Renting from you guys was exactly the way I like to do business. Fast, simple, to the point! Everything happened exactly as your web site said it would. If every company I worked with did business like you guys the world would be a happier place! Thanks again and I look forward to working with you in the future." "Great experience. I knew nothing about containers, read the info, called with questions and all were answered. Bought 2, they scheduled the delivery service. The driver was very helpful with the delivery and the containers were in great shape. Nothing more I could have expected. Thanks to everyone for making it so easy. :)"
"Very friendly customer service, no hidden fees or nonsense billing issues and quick delivery made it a great experience. If another container is needed we'll buy again from Western Container Sales." "Thank you! Very smooth rental process. The delivery was prompt and the driver did a great job of getting it where we wanted it. We are very pleased with the container as well. Thank you!" "Arrived on time and as described and the driver did a great job. Thanks!" "...the on-line process was very simple and the containers arrived on time. The skilled driver delivered them with professionalism and expertise." "Reps were very helpful arranging delivery of storage container. Driver was also prompt and helpful with delivery." "You guys are great. The process is super easy and your staff is great to deal with! Thank you!" "Delivered the box when you said you would, the driver was courteous, professional and nailed the drop. Thumbs up!" What Makes Western Container Sales Different? 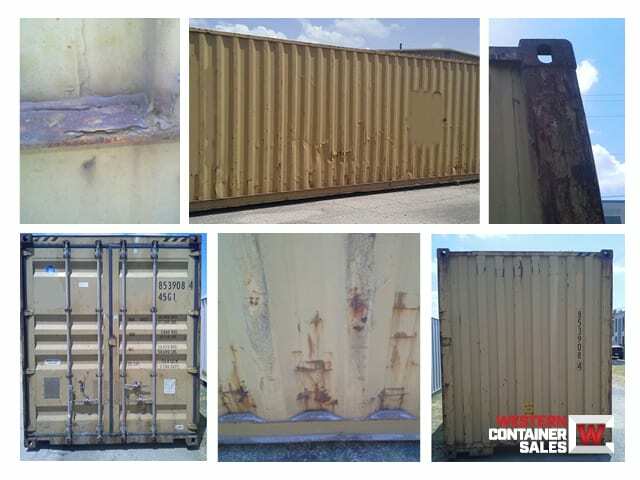 We're one of the largest buyers of used shipping containers in North America. By working directly with some of the largest intermodal shipping container companies in the world, we help our customers leverage our buying power and quality standards to buy quality shipping containers at a fair price. We also believe in providing up-front and transparent pricing. We're proud to have helped thousands of customers buy conex containers and rent storage containers throughout North America. How Do you Buy Shipping Containers in Toronto, ON? Not sure how the process works...? Watch this video to better understand where the shipping containers come from. And be sure to check out the sample photos before you buy. Prefer to Rent Storage Containers? Prior to the 1950's, loading a cargo ship was a laborious process where cargo was loaded piece by piece onto a ship. During the Korean War, the US military developed the "Container Express" box system to make transporting supplies simpler. The term "Conex" comes from that system, and Conex is still synonymous with shipping containers to this day. 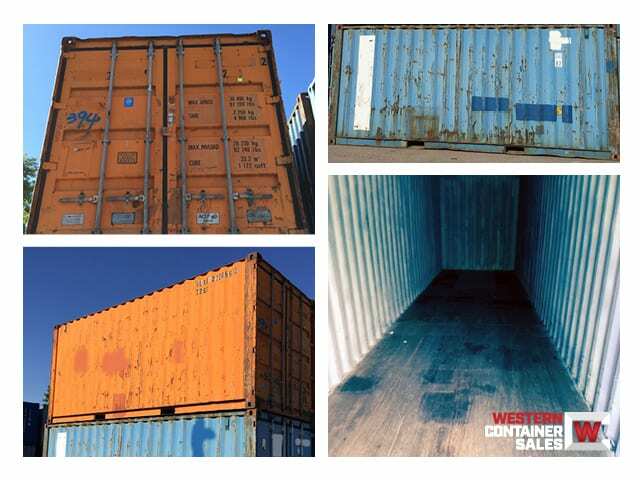 There were also a large variety of different container systems in use prior to the 1950's, but each shipping container was still very different from company to company, and not easily interchangeable. Malcom McLean is often credited with "inventing" the shipping container, but that's a bit of a stretch. McLean was certainly the first to successfully commercialize container shipping, but definitely was not the first to come up with the idea. For instance the Bureau International des Containers (BIC) was founded in 1933, 23 years before McLean would shuttle a few dozen containers from Newark to Houston on a re-purposed World War II cargo ship in 1956. Matson would soon follow, and began offering containerized freight services two years later. Sealand (Malcom McLean's original container shipping company, now owned by Maersk) had 33' and 35' shipping containers. Matson's shipping containers were 24' long. In the late 1960's the International Organization for Standardization (commonly referred to as ISO) established standards for shipping container dimensions via ISO 668. Due to the standards set forth by the ISO, containers are now measured in TEU's (twenty-foot equivalent units). Today there are over 34,000,000 TEU in circulation (or roughly 20,000,000 shipping containers). A sticker or plate to identify such things as High Cube containers, hazardous cargo, or other such labels. High Cube containers will also have yellow decals at the top of the frame on each end, to make the extended height more noticable. The Convention for Safe Containers (CSC) Plate includes information on the date and location of manufacture, as well as other specifications. Learn more about the Convention for Safe Containers on the International Maritime Organization's website. Metal rods, bolted to the exterior of the container door and frame, that seal the door tightly when twisted closed and clasped. A broken or bent locking rod can mean that a door won't seal properly. We guarantee doors will seal on every container we sell. Each container has a unique ID, with the first three letters representing the owner (registered with the Bureau International des Containers "BIC"), followed by a "U" and then six more digits. The 7th number is a "check digit" used by calculating the value of each letter and number in the ID. Check your check digit with BIC. To ensure safe handling, and stacking on ships, containers should not be loaded heavier than the weight specifications listed on the door and CSC plate. Please note, however, that local shipping weight regulations may be much lower than the maximum payload of the container. Each of the cargo doors is fully surrounded by a rubber gasket. The gasket allows the steel doors to be shut tightly to prevent both weather getting into the the container and cargo from spilling out if the freight shifts or pallets fail during transport. Good gaskets are essential to a container being wind/water tight. How Do Steel Storage Containers Compare to PODS? The largest nationwide portable storage company is PODS (Portable On Demand Storage). While both PODS and Western Container Sales offer nationwide portable storage rentals, there are some key differences... Primarily that PODS' containers are smaller, lighter units that are made from fiberglass, aluminum and plastic, and designed to be moved while loaded. 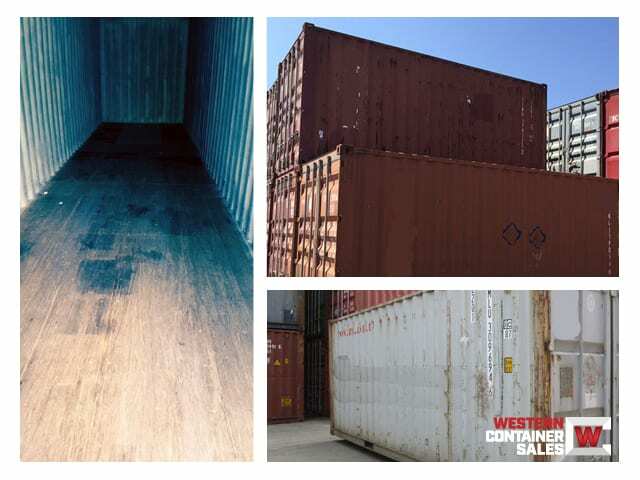 Western Container Sales rentals are made from re-purposed used shipping conatiners (all steel construction, with wood floors over steel cross members). 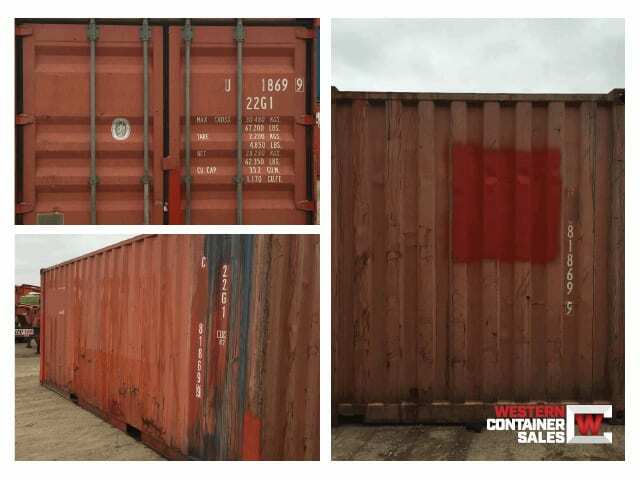 While Western Container Sales offers steel storage containers in sizes up to 40' in length, PODS offers smaller, 8', 12' and 16' storage units with aluminum and plastic exteriors. Steel shipping containers are difficult to load/unload without the heavy equipment found at ports and depots, but PODS units are small enough to be easily managed with light duty lifts. Western Container Sales does not move loaded units, so if you need your container moved after it's loaded PODS or similar companies might be a better option. However, if you need storage at your location we offer larger, all steel containers. Our cost per square foot is almost always lower, as well.